The Rangers goalie Henrik Lundqvist (30) watches the puck go past him during the game between The New York Rangers and The Anaheim Ducks at Madison Square Garden. The Anaheim Ducks took nothing for granted on the last day of their longest road trip of the season. 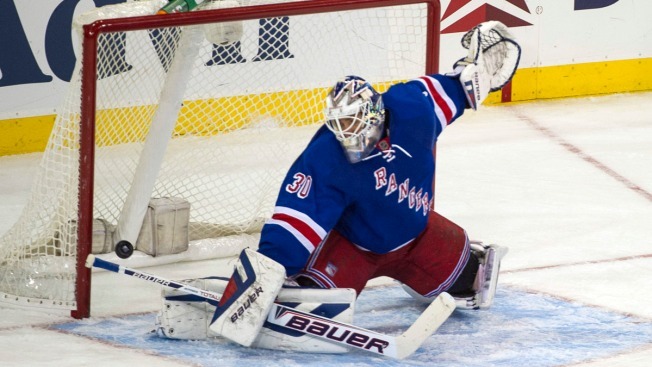 They didn't sit back and put the New York Rangers into an early hole they never got out of. Frederik Andersen made 32 saves to stay perfect in four NHL games, and Corey Perry and Kyle Palmieri scored first-period goals to lead the Ducks to a 2-1 victory over the Rangers on Monday night. "To play in Madison Square Garden is something special. I love New York," Andersen said. "There are so many great things to do here, and I guess another one is to win a hockey game." The Ducks finished a season-high, eight-game road trip 5-2-1 — including 5-0-1 in the final six games. Perry and Palmieri staked Anaheim to a 2-0 lead just 9:09 in, and the 24-year-old Andersen did the rest. "He was huge, kept us in it all night," Palmieri said. "We were able to get those two goals, and he made it stand up. He's been awesome. Tonight was no different." In four NHL games, all this season, Andersen is 4-0. He has allowed a total of five goals, and only defenseman Michael Del Zotto got a puck past him. "We dug deep for this one," Perry said. "Last one on a road trip is always the toughest one, and we earned it. We're ready to get home." That killed any chance of a comeback. "Sometimes goalies have to come through," Ducks coach Bruce Boudreau said. "We started playing like we didn't want to lose instead of going after them, which I think we did for most of the third period. That's when you need your goalie to come up big." "It was definitely not the way we wanted to start off this game," Lundqvist said. "They showed why they are a good team. They make you pay when things like that happen early. "We could've easily had at least a point today." Andersen preserved his shutout — albeit briefly — when he made a stellar save of a hard one-timer from the slot by Brad Richards with 1:44 remaining in the second after Richards took a feed from behind the net from Carl Hagelin. The Rangers kept the heat on the Ducks, who were forced to ice the puck. New York regained control on the ensuing faceoff and cut the deficit to 2-1 with 1:24 left. Rangers captain Ryan Callahan put the puck on net, and Hagelin whacked at the rebound. With Andersen sprawled on his stomach, Del Zotto scored his first of the season from the lower edge of the circle. That sparked the crowd, and the fans were still cheering when McDonagh twice knocked Perry over the short boards and into the New York bench. McDonagh kept him doubled over the second time, and Rangers coach Alain Vigneault kept an arm around Derek Dorsett to prevent him from taking any shots at Perry as the period ended.